I used InfiniteWP for many months but found it undependable. The customer service tried to help unsuccessfully. I’ve just switched to ManageWP and so far so good. These systems make managing a number of websites so much easier. Moving from IWP to ManageWP was no small decision for me. I loved IWP and the Lifetime license was a heck of a deal, but after several months of struggling with Timeouts and Backup Failues etc. I couldn't handle it anymore. It was costing me money trying to save money with my IWP Lifetime bundle; time is money as they say and I was spending too much time with IWP issues. I couldn't have those issues while actively promoting that my clients sites were secure and backed up. That would have been a lie and god forbid something horrible had happened during that time, I would have been up s*** creek. Spend an evening moving WP sites from InfiniteWP to ManageWP. Pretty good experience. 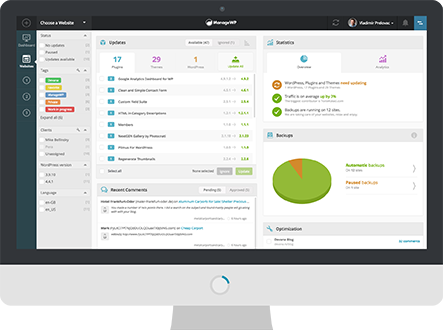 The ManageWP Team managed to build something quite useful for web agency geared toward WP. I'm quite happy to use it every day. Since the launch of Orion, I've switched from Infinitewp for you guys for 1 simple reason : Value shown to customer because of a better reporting tool. As you already know it, selling ongoing maintenance to our customer is the way to go to have a steady income month after month & also keep our customer close when they need something. Free and Premium. Localized to 11 languages.